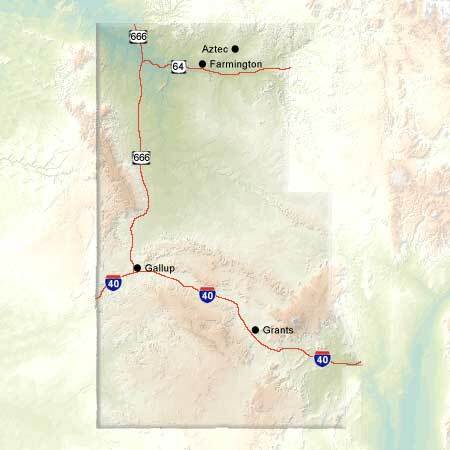 Some people refer to the Northwest Region of New Mexico as "Indian Country". Here, Route 66 winds through gaudy billboards declaring such offerings as Gila monsters, turquoise jewelry, and ice cream at roadside curio shops. However this region also offers much more. A large part of the Navajo Nation lies in New Mexico's northwest, and nearby, other tribes such as the Jicarilla Apache offer recreational and cultural opportunities for visitors. In this region, the volcanic landscape gives rise to the tallest mountain of the area, Mount Taylor, which is sacred to the natives, and whose steep slopes also present an international climbing challenge each February. Strange, twisting rock formations are evident at Bisti Badlands Wilderness and farther north at Four Corners. And there's water here too, especially at Navajo State Park near Farmington, which is next to the San Juan River and adjoining Quality Waters, where some of the finest trout fishing can be found.